Fiesta ware is manufactured in the USA and is a sturdy, simple set of dishes and accessories with elegant but humble lines. Fiesta, in my opinion, is best known for it’s bright, solid colors. Every once in a while a new color is produced and/or an old one is retired, making collecting fresh and exciting. My parents got me started on my fiesta collection in 1998 with cobalt blue, and over the years my collection has grown with many of my friends and family members giving me pieces (thank you!) I used to be much more passionate about adding, but other interests have taken over my time now. I remember the days of going to tag sales just hoping for a find. I think the best day was when I bought a small fiesta teapot clock for ten cents, which has since been broken by the children (it ticked nicely but never did keep the correct time, it was totally worth the 10 cents). Crackerbarrel used to carry Fiesta in their giftshop, but my best sources now for an immediate purchase is Macy’s or Kohl’s. At full price, it is very much out of my price range, I only buy on sale and sometimes find a good clearance price. Brimfield Antiques show (locally) is a great place to purchase seconds and I usually get a piece when I go with my sister once or twice a year. The best way to receive Fiesta is as generous gifts, but the best way to buy it for yourself (or for your friend Shanda) is online. The HLC Fiesta outlet store is great. They ship quickly and everything is packaged so nicely. 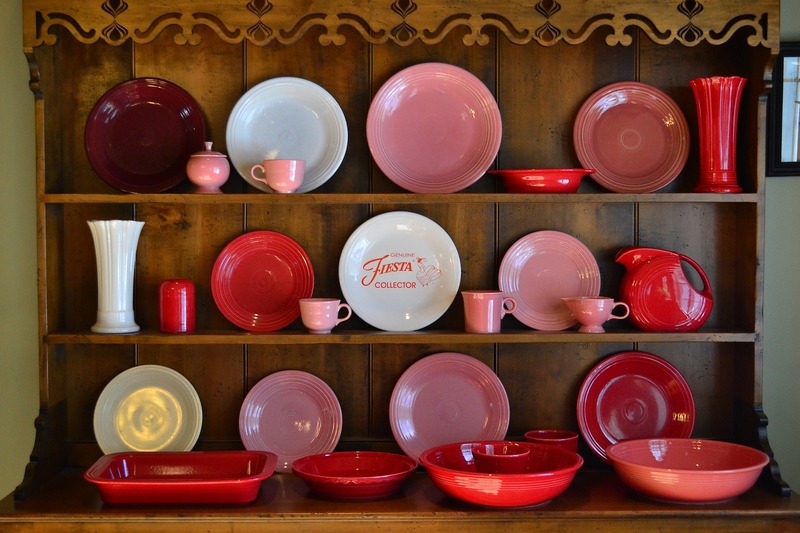 It’s a treat to open a box of smooth, shiny fiesta ware, especially if you’ve ordered a variety of colors. Yesterday, I sadly put away all my Scarlet and Rose and White, and happily got out all the GREENS. The plate on the bottom left is lemongrass and I don’t know if it really belongs but for the “grass” I kept it, although it is more of a “lemon”. It is Ethan’s favorite color, too. It’s Ethan’s 16th birthday tomorrow, so this is a nice display for the birthday boy, too. 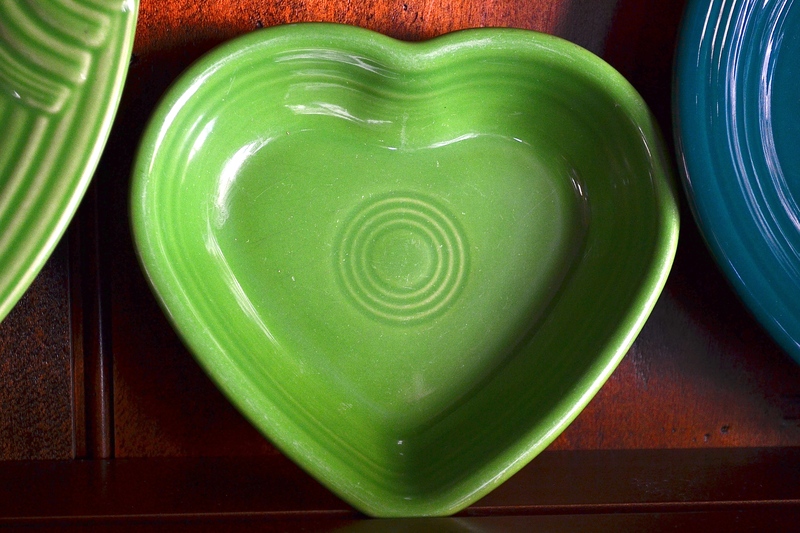 This is a small heart shaped Shamrock bowl. My friend Elissa sent it to me. I remember opening it and being doubly thrilled because #1 it was fiesta, and #2 I did not know that the heart shape even existed. My friend Kathy gave me this vintage forest green covered sugar dish. I love the handles. I usually keep this one in a glass cabinet to keep it safe. It feels delicate in my hands and I worry about it’s knob on top, too. Isn’t it beautiful? 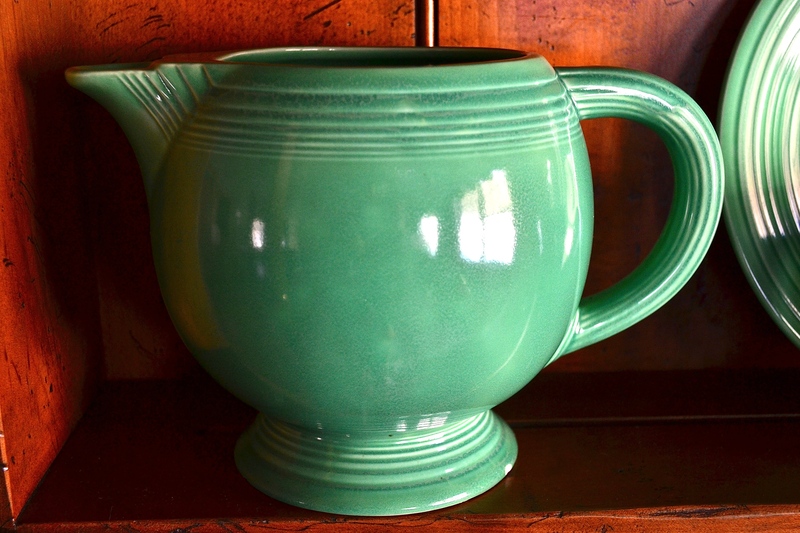 I found this vintage light green ice lip pitcher at the antiques show in Brimfield. It was only 15 dollars because it has a chip. It’s solid and nice and round, so friendly, I use it for water and as a vase, too. 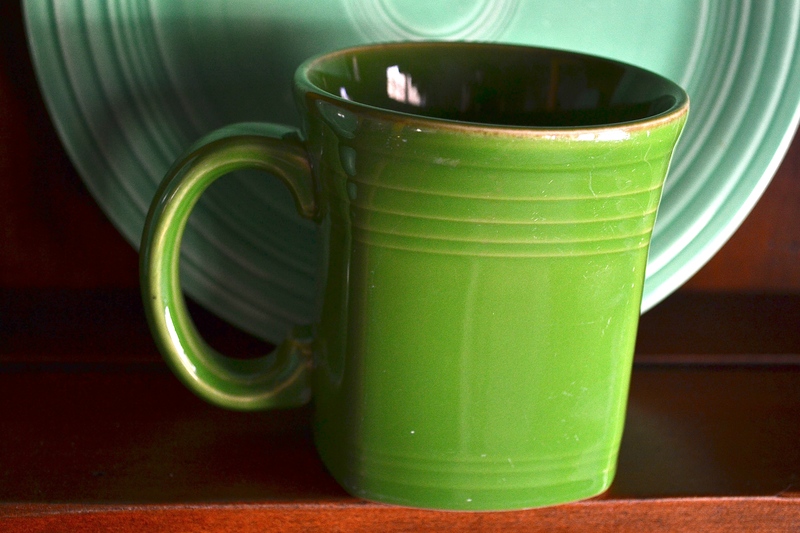 This is a modern piece, square Shamrock mug with a java handle (fiesta typically has the trademark “ring” handles). I found some vintage fiesta ware at a local antique shop and the lady who was selling it had more at her house that she invited me to see. This medium green tea cup was one of the things she sold me from her house while serving me freshly picked raspberries from her vines out back. Medium green is the most valuable of all the colors and I brought it home with shaking hands. 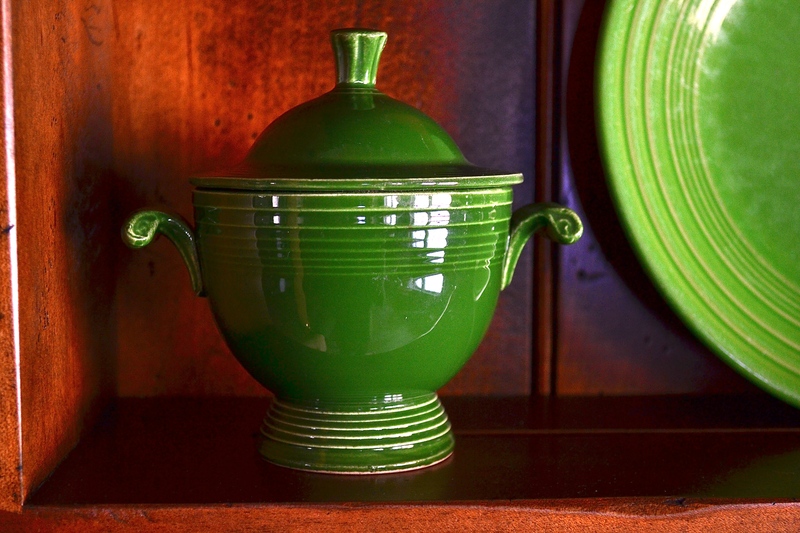 (The color is also referred to as “John Deere” green to help differentiate the different shades). It was only produced for 10 years, from 1959-1969. Only one of my vintage light green salt and pepper shakers has the original cork on the bottom. 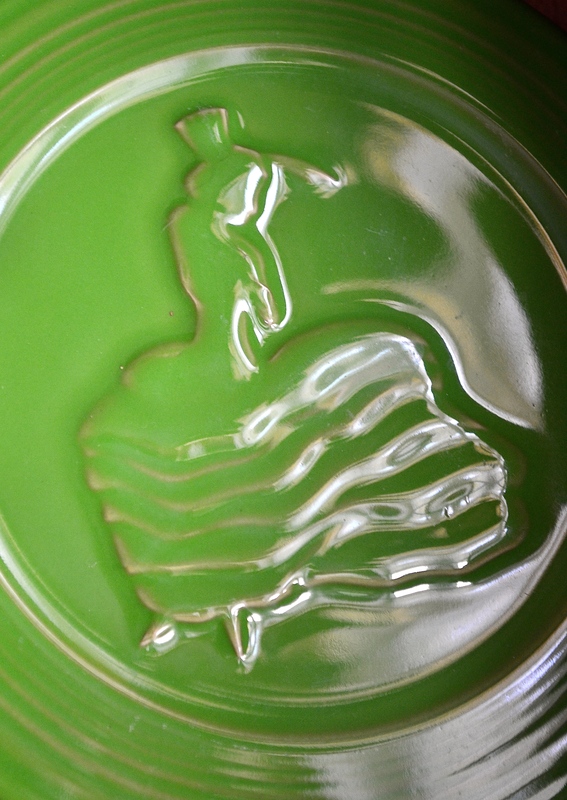 The lovely dancing Fiesta lady on a Shamrock trivet. 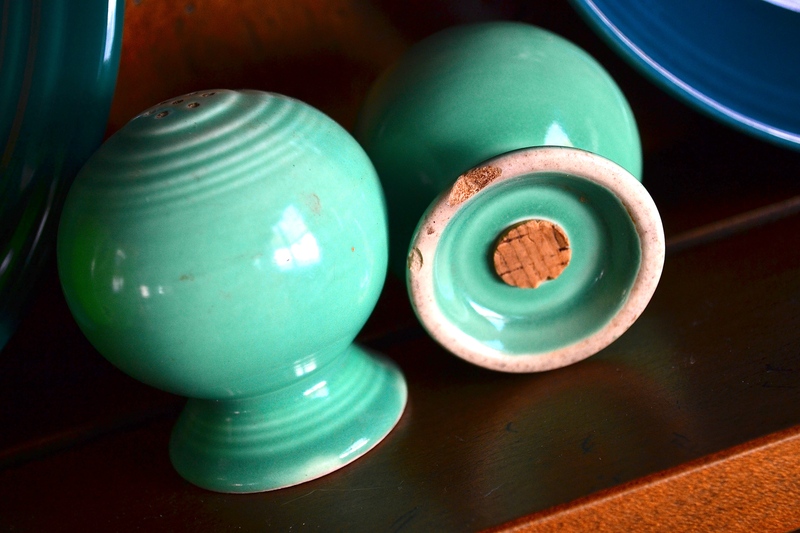 The pie plate on the bottom left by the shaker is a retired color…Juniper….and the top oval plate is also a retired color…Evergreen…. The fancy looking large platter on the top is part of a dip set. A small straight sided bowl goes in the middle (lost). The creamer in front of it is Seamist green. 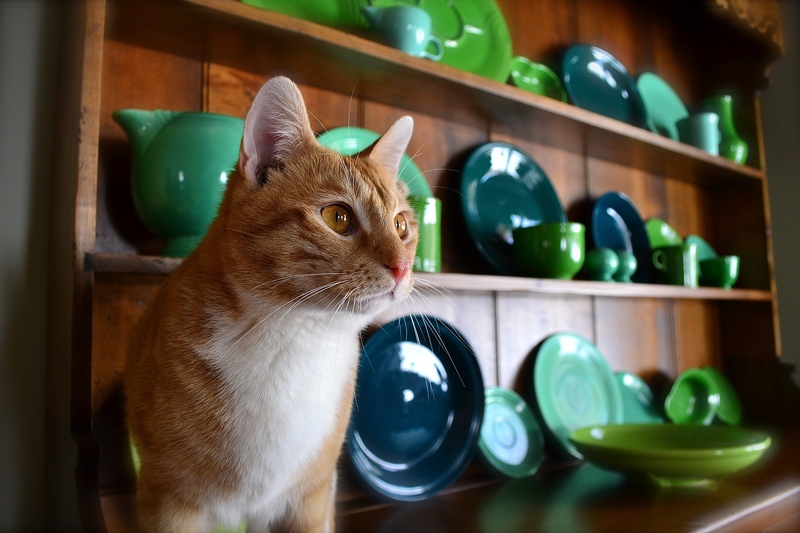 When I was photographing my dishes Sherlock was trying so hard to get my attention. Even though he’s orange, I added him to the display. 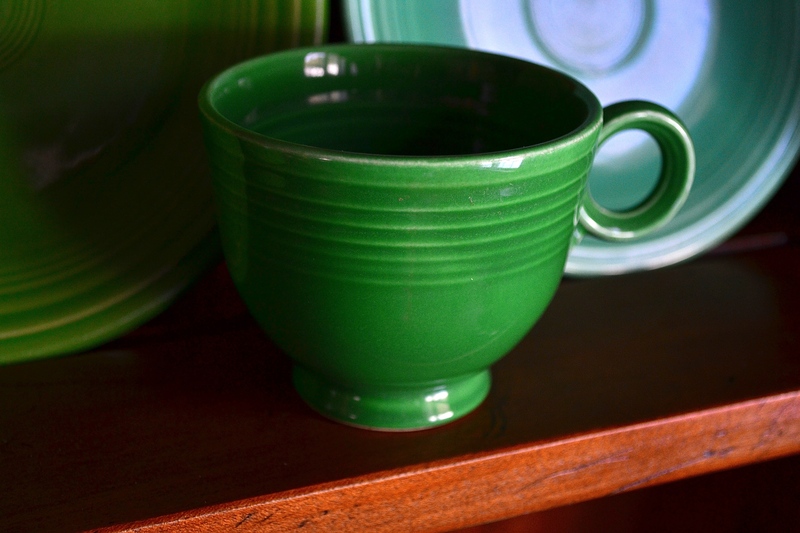 This entry was posted in home, it's the little things and tagged fiestaware by Shanda. Bookmark the permalink. I love your displays. 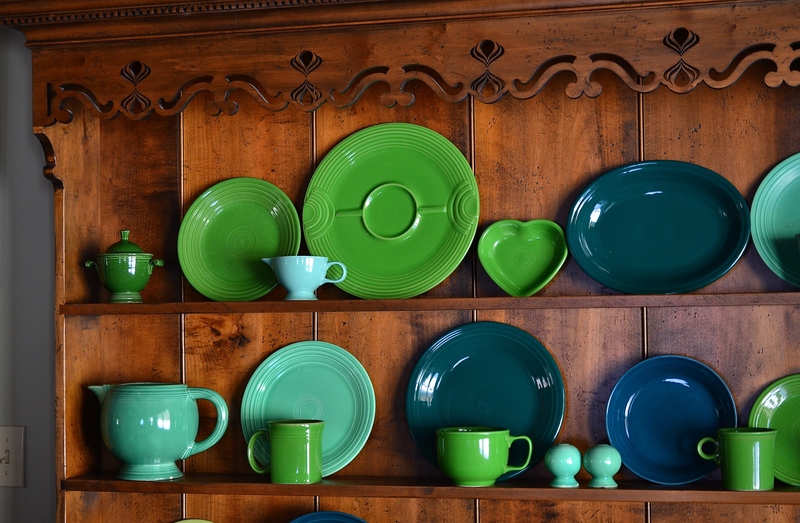 Someday I am going to have some Fiestaware. It is so neat you have dishes in colors for every season! I collect teacups, linens, and old books.I hhaven’t been to an antique store but maybe soon. Spring break is next week. Maybe my daughter and I will go. How pretty! Love your display. I used to get really excited over new pieces too..I still do, but not the same as when I first started collecting. 😉 However, I do still leap out of my skin when I find a rare or special piece or color. My husband’s cousin just sent to me an original red bowl she found at an antique store in PA! For the past year or two, my favorite fiesta color has been the vintage light green. I only have a couple light green pieces, and don’t really let the kids near them. Haha. Thanks for sharing your collection…as a fellow fiesta collector I love seeing what pieces others have and how they display it. hi shanda………thanks for the fiestaware tour! I, too, like to change out colors according to the season or month. right now I’m using my green and blue pieces for march (shamrock & turquoise). 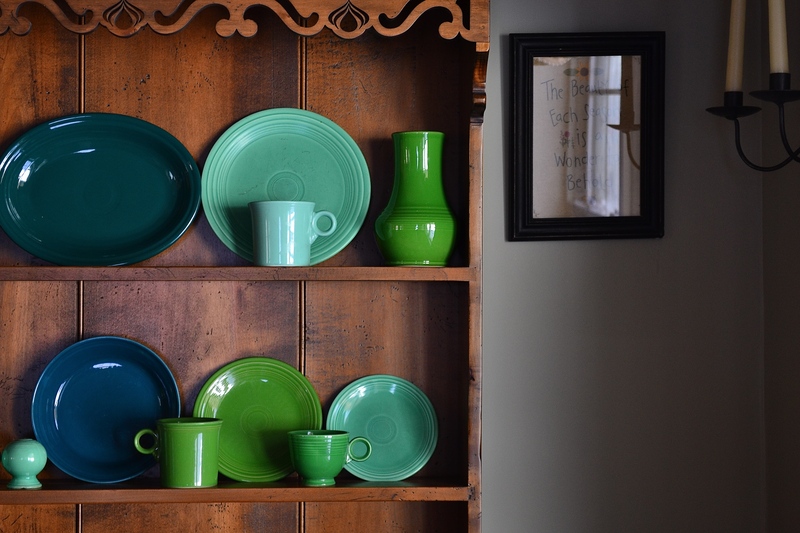 yours is so pretty to look at displayed in your hutch! How fun! I love what you are doing with your display of dishes! You got me hooked on these things now! I have a special appreciation b/c of you! 😉 although I own only colbalt and one yellow bowl (from you)… I must say I really like my dishes especially the small tea cups.. Thanks for your influence! They’re all so pretty. I’m glad you share them with us! 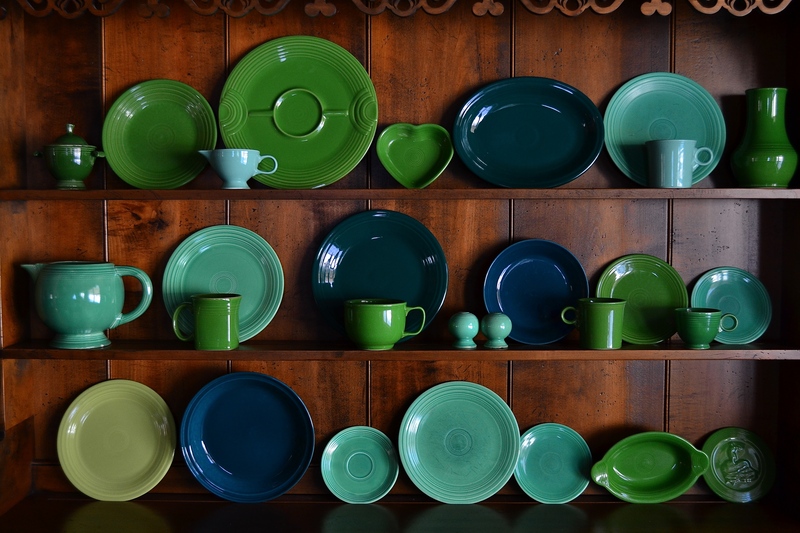 You make me wish I collected fiestaware! I just love the colors, and the shapes of it too. I love this post. I stumbled onto your website. How fun! I just started my collection at christmas with flamingo. Now it is retired, so sad. I wish paprika would have been the one to retire.the bake ware is truly the best .